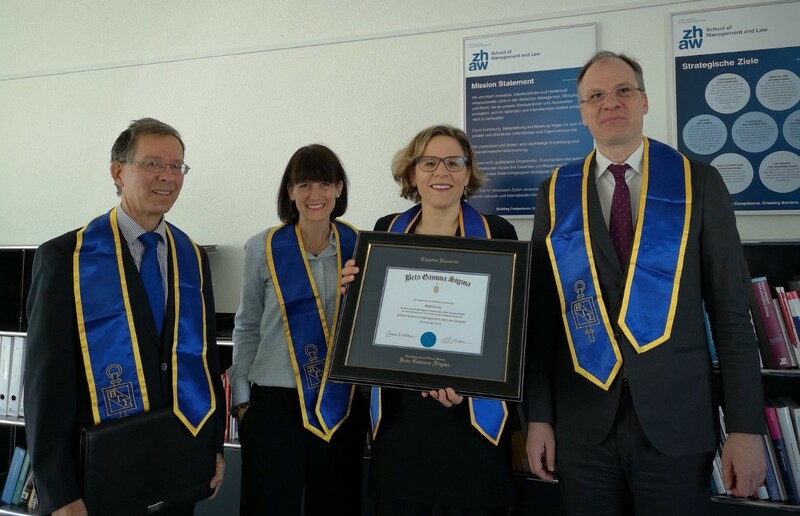 The freshly inducted Chapter Honoree Nadia Lang (second from the right) with Prof. Reto Steiner (Chapter President, right), Prof. Christine Hallier (Chapter Advisor), and Daniel Ulrich (Chapter Managing Director). A BGS collegiate chapter can recognize business leaders by awarding them a lifetime Beta Gamma Sigma membership. After being nominated in 2018, Nadja Lang has now been recognized as a Chapter Honoree. She graduated from “Höhere Wirtschafts- und Verwaltungsschule“ (HWV), a predecessor institution of the SML, and has had an outstanding business career. She serves on various boards, including Schweizerische Post AG (Swiss Post). Furthermore, Nadja Lang is a valued member of the SML Advisory Board.